Fully imported, luxurious and top of her class, the Robalo R240 is made to perfection. With everything you could need from a sportsfishing craft, she’s one that should be at the top of every angler’s most-wanted list. The R240 is ideally suited for conditions from Cape Town to Mozambique due to a variety of unique design elements and exclusive patents. Kevlar reinforced, this dual/centre console (dual for the skipper, centre seat on the front of the helm) is created to be strong. After all, it has the 10 year limited hull warranty for a reason! I met up with Craig Wilson on a day which could be described as ‘less than ideal’. Ordinarily, we don’t get into trailer specifics too much in reviews – but I think there’s a case for that in this particular review. 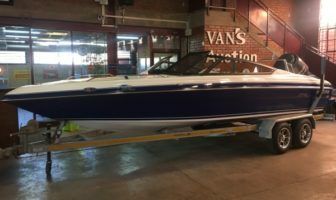 The R240 is seated on a big doubleaxle American built aluminium trailer and was shipped to Cape Town before being towed to Durban some 1 500 km away – telling me that, although it’s a big boat, the R240 is built for as much speed and comfort on the road as she is on the water. The trailer also has decent sized bunks on it which puts the R240 pretty high up on the trailer. They extend past the back of the trailer which is nice for preventing damage when retrieving her; but they’re a bit long for my liking and you’ll have to remember to trim the motors up come retrieval time. I’ve spoken with Honda Durban on this point and they’re looking into changing the length of these bunks. 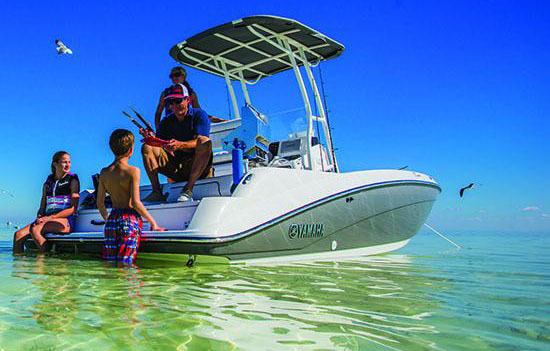 The R240 has a unique retractable step ladder which you’ll definitely need if boarding from the water or trailer – and once onboard, you start to take in what this craft is all about. 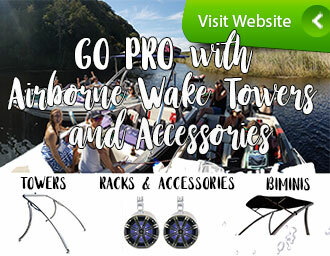 From top to bottom, she is designed to be a true American sportsfisher and you could add the necessary toys you’d want for your own style, like outriggers and downriggers. The design itself is well thought out, utilising every millimetre of usable space. This particular manufacturer comes highly recommended for as much their attention to detail as well as their liberal use of top-quality finishings – and it’s evident why on this R240 model. Onboard, and once through the transom walkway, you’ll notice all that’s in store for the angler – like rod storage (a total of 14 rods can be stored around the boat!) and a neat tackle box/lure tray storage in the gunnels. This craft is designed to be open and spacious with concealed packing space; and if it’s storage you’re looking for – fish goes into the hatch in the bow while other items can be safely stored under the bow seats. Being a properly built, solid monohull, there’s not much space below deck. As such, built-in storage has been criticised as being a bit minimalistic. The actual hatch for the 340-litre fish box in the bow (deck) could be a little larger if you’re going to hook a sizable Yellowfin tuna, and the storage below the bow seats can be drained – and therefore also used for fish storage. To me, the R240 has got as much storage space as the efficient angler could need. At the transom is a large livebait well that holds about 115 litres of water. Being a monohull, balance has a lot to do with this craft’s lateral ride – and having a full livewell centrally, like the R240’s, means that the weight is evenly distributed to give a ride which is stable. A bait prep area with a cutting board is fitted alongside the livebait hatch and both can be concealed with hinged lids to leave the area easy on the eye and totally freed up for fishing. 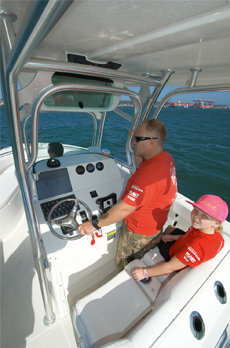 A spacious, user-friendly head is built into the deck, inside the helm console. Here, you’ll find a proper VacuFlush marine toilet and basin, and is piped with fresh water for the hand shower. The helm station is really, truly, super nice. It has a unique seating system which allows the skipper and/or copilot to sit in luxury – or simply fold back the base and stand comfortably; I’d call this a ‘must’ when the water starts getting very rough. Well thought out and practical for skippering, the helm is built to be easily accessible and comfy – no matter the conditions. This R240 is a demo model, so she wasn’t fully equipped for our review; so the space for a GPS and other gadgets had been left uninstalled for now; but there’s plenty of space in the binnacle for your every need come fitment time. Covering the helm is a large, sturdy, and probably over-engineered T-top which has a neat waterproof locker for radios, dry clothing, maps and more, as well as the basis for the outriggers. It also has powerful LED lighting should inclement weather become problematic. As anglers do, washing down the deck can is a necessity. For this, an extremely powerful seawater washdown system is plumbed into the craft. This R240 is fitted with a set of counter-rotating 150 HP Honda 4-Stroke outboards with stainless steel props. A westerly wind was picking up and our time was limited due to the swell and chop gaining in size. In fact, we left Durban Harbour for the review – but taking pictures in the bay with those waves was impossible, so we had to retreat to the harbour to complete the photographic side of this article. The swell was rolling in at about two metres in height and the wind gusting to just under 15 knots. It was a day I wouldn’t be inclined to go out in normally. The top speed and the manner in which the R240 handles it is quite something. We managed to get a performance of around 37 knots in moderate conditions – thanks to the outboard’s VTEC system which kicks in at 4 500 rpm, engaging the cam lobe for high RPM operation. When the hammers aren’t down, the LeanBurn control keeps these motors light on gas and the three-way cooling system allows the cylinder head to be cooler for long-term durability. But more so than just the outboards, the R240’s notably smooth ride, pace, and softness, comes from the patented hull design. Reversed chines on the hull provide a cushioning effect as she bolts across the surface and wide strakes on the sides of the hull make her stable. 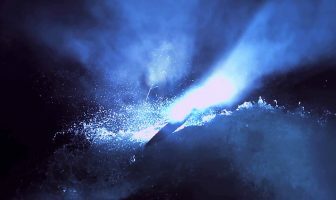 This forms part of their HydoLift design – where it all comes together with a result which is actually rather efficient in the water. This Robalo is fitted with trim tabs for fine adjustments – but in all the conditions I experienced, they didn’t need to be touched once set. I was quite surprised at this monohull’s ability to be laterally stable, even when running side-on in the swell. She also handled brilliantly in a following sea (requiring no additional trim from the plates) and received no cavitation in the corners. I had a bit of sea spray hit me from the side, but only as a result of a gusting wind; aside from this, I remained as dry as an Arabian’s flip-flop. Quality comes at a price, I’m afraid. But, if you consider her top-class quality and appeal, and that you’re getting a must-have for the ultimate in sports fishing luxury, given her size, then it’s actually pretty easy to take out the cheque book. 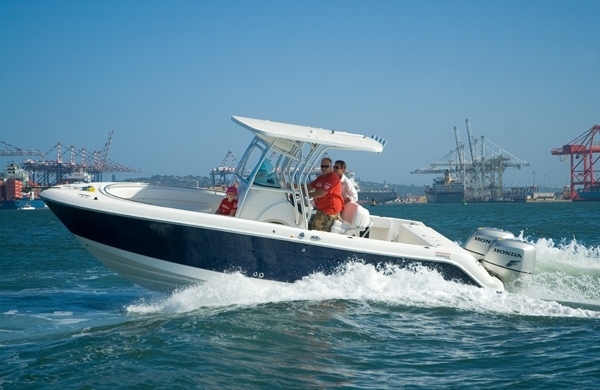 The Robalo R240 comes in at a price of R1 150 000. 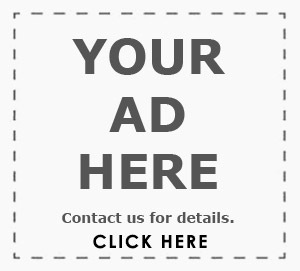 For more information, contact your local Honda Marine dealer or call the Honda Marine Team on 0800 466 321. Next Article Riviera 33 Gunners makes stunning debut!